As summer’s already dawned bright and hotter than ever (thank you, global warming! ), I suppose we may as well stay indoors and watch the final episodes of Game of Thrones, or maybe sit under the shade of a poolside umbrella sipping on a smoothie – it’s too hot to do anything else. 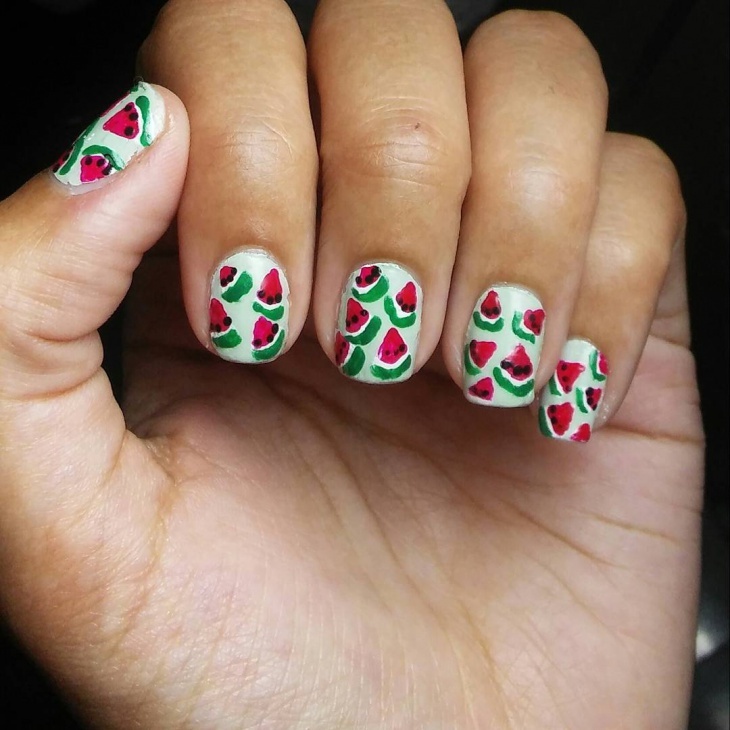 Fortunately, painting nails is something you can do without breaking a sweat (or a nail!). 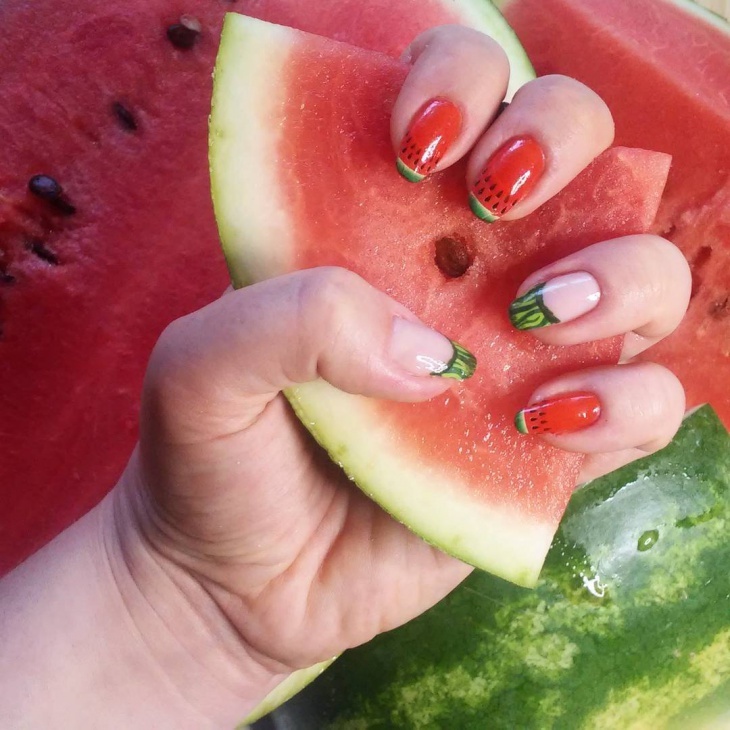 This summer, what’s ‘in’ is worth taking a bite of: watermelon nail art! 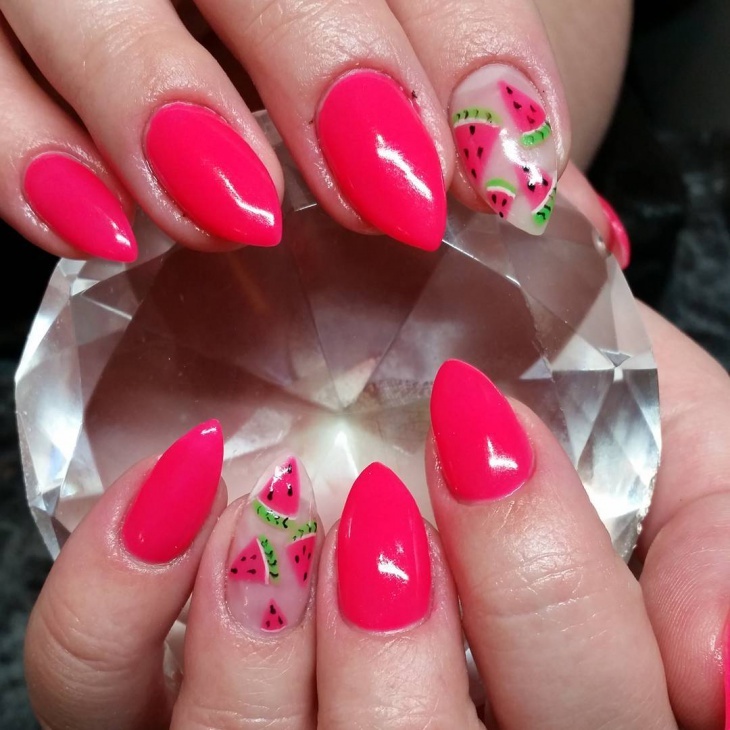 Something you can chew on without feeling slightly disgusted would be this particular kind of nail art. 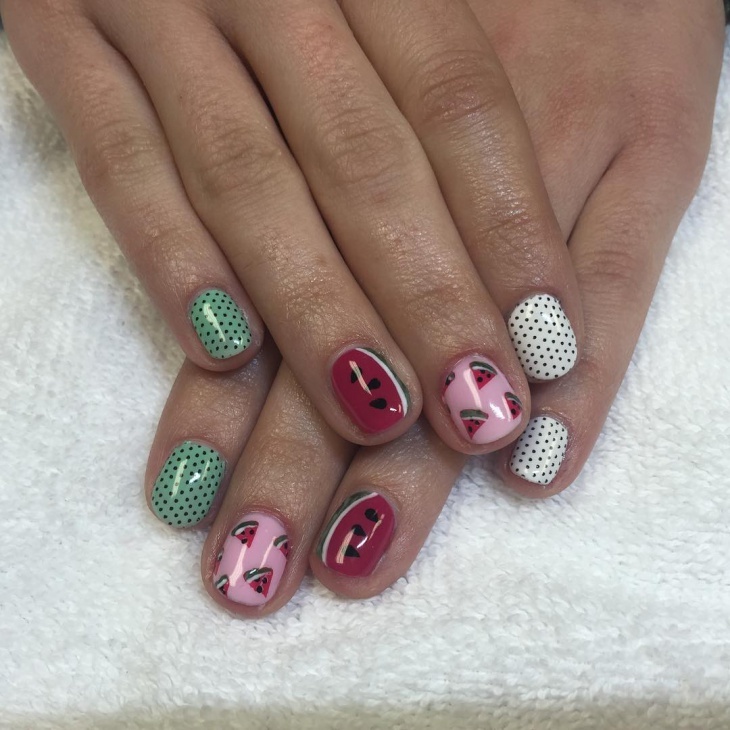 Using a candy pink base, a nail art brush is advised to create the green border (not at the tip) and the white rim. 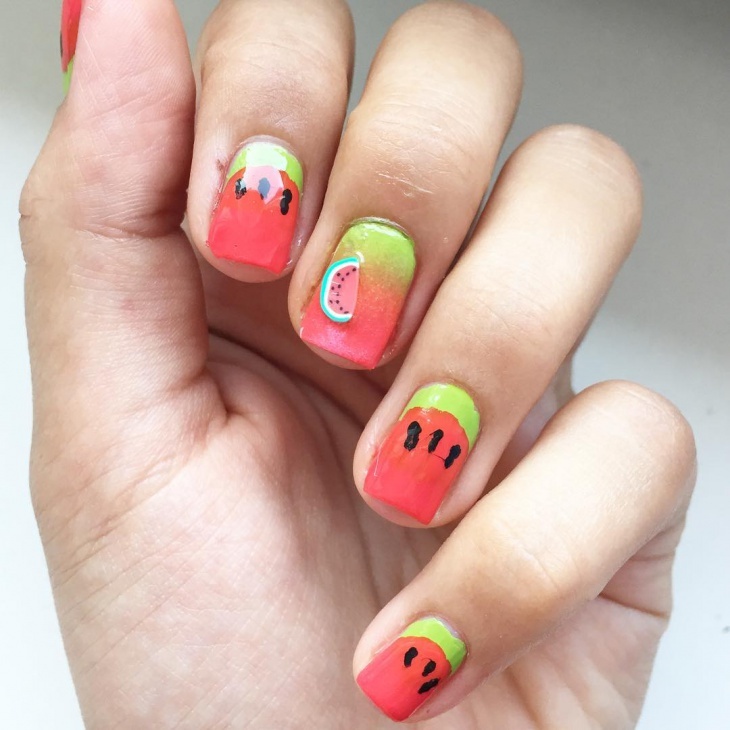 Don’t forget the top coat! 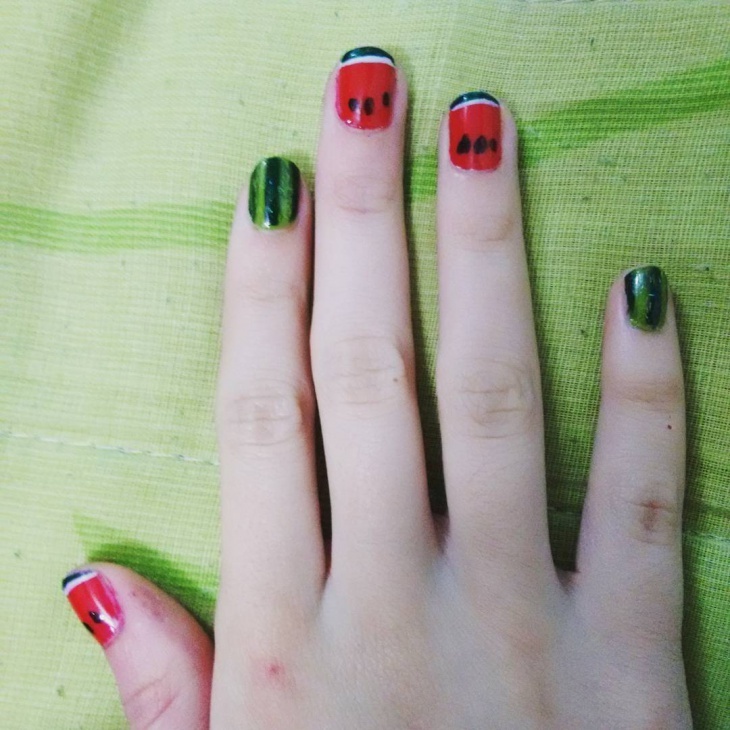 Watermelon nail art for short nails is for you if you’re the kind who’s not really into growing your nails, but still like nail art. With just as much pop as the above, the lesser space may make for a challenge when it comes to detailing but be patient! 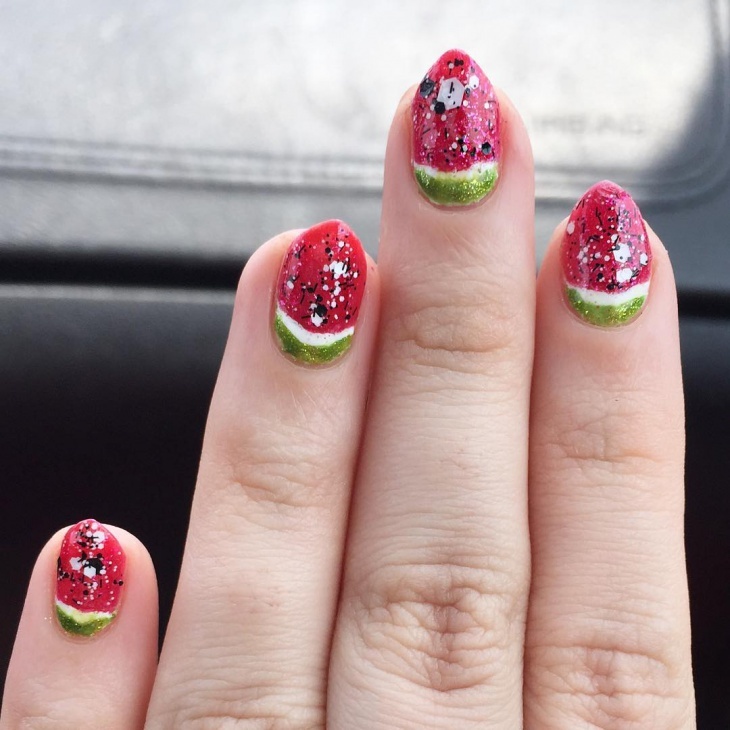 A nail art brush (or even a handy toothpick) really helps. Keep some kitchen roll paper to carefully clean the edges. 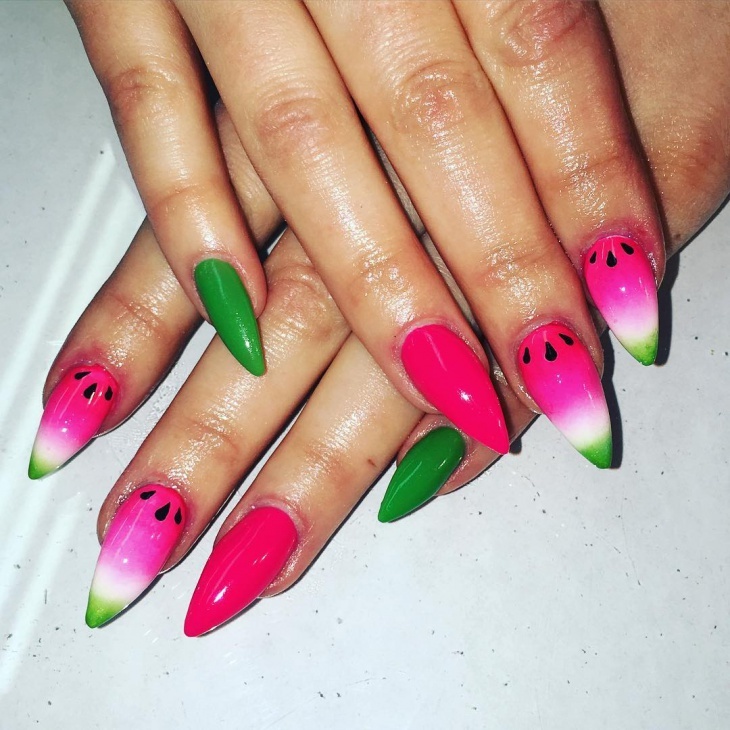 The one below is similar to the first, but less complicated – the shell of the watermelon faces outward, on the tips of the nails – and an interesting way to precede a handshake! 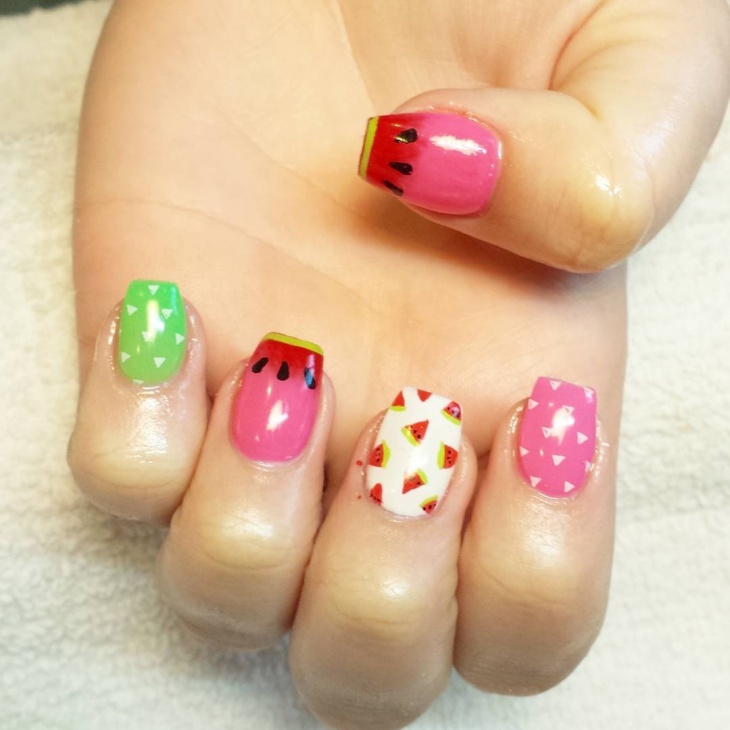 Change the finger: Euphemisms aside, if you’re bored with simple fruit designs that are the same on every fingernail, why not mix it up a little? Make a colour palette out of the fruit by going in for blocks and patterns, like this one here. It’s a pretty savvy way of working little and gaining more. 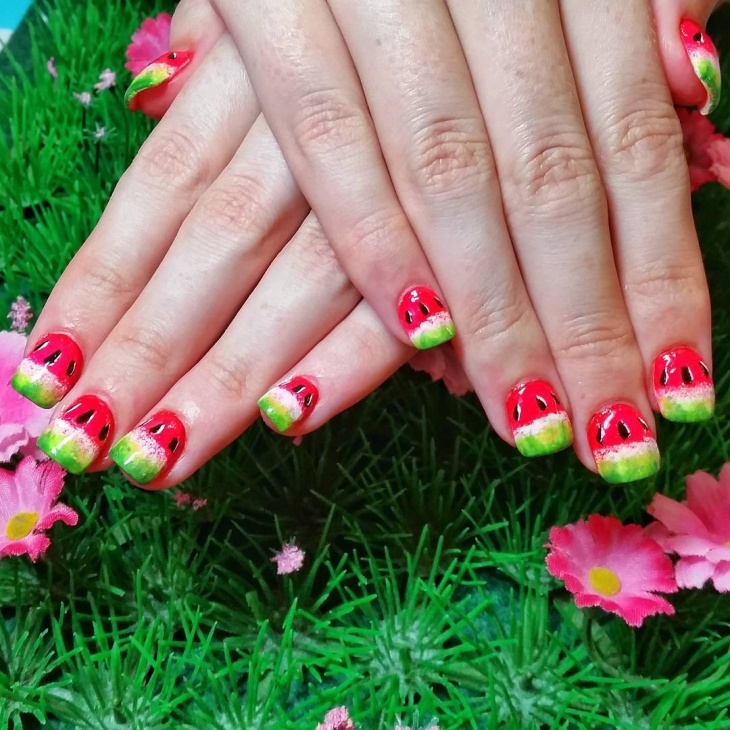 And it gives such a hipster feel to your nails, too. Then again, if you’re fond of seeing a little more uniformity, why not conceal a surprise on each hand? 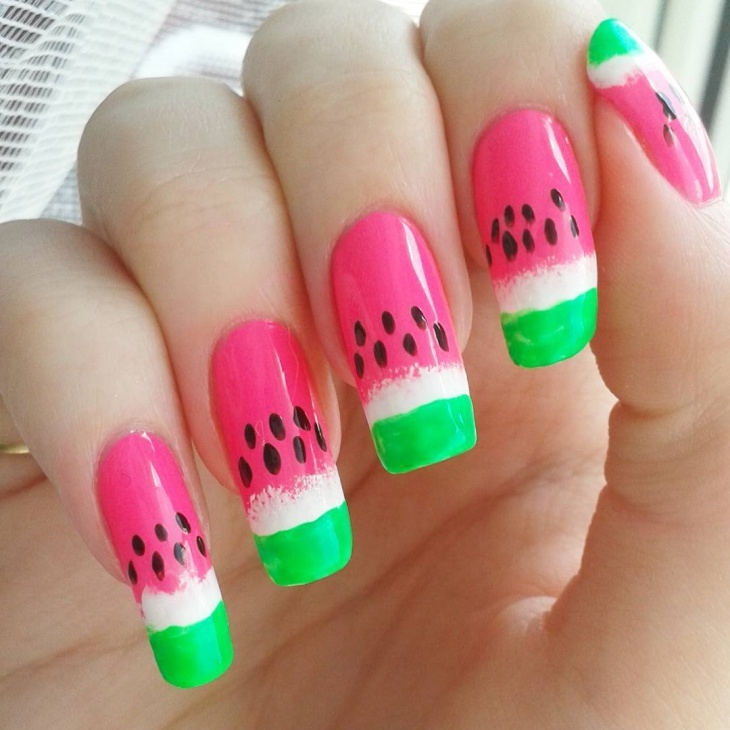 Take one colour and singling any finger out, paint the rest in any shade of pink, for the flesh of the watermelon. This is easier too, giving you more time to spend on the details when it comes to that single finger. 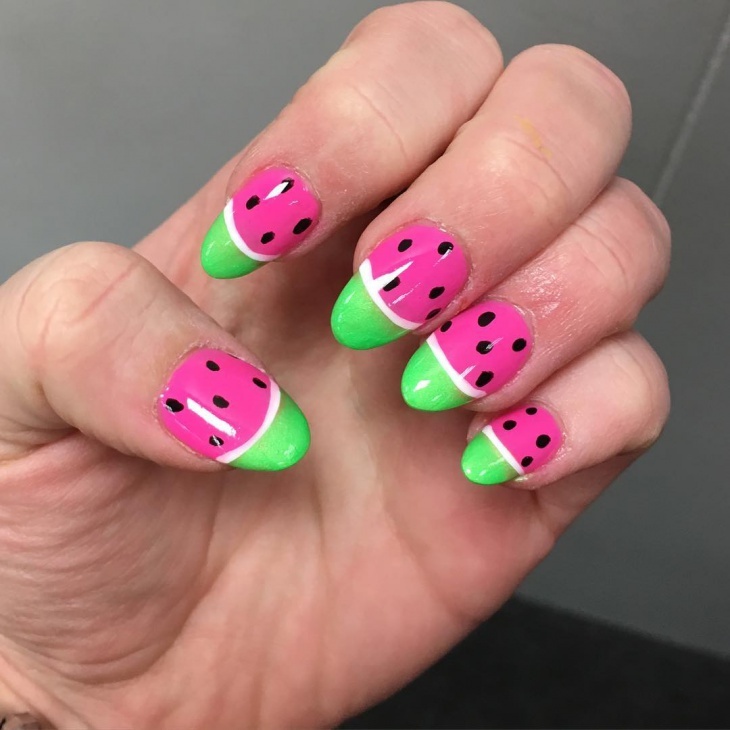 Or you could just go ahead and paint all the nails the same colour, adding the design after the first clear top coat dries. A lovely pomegranate pink-red is a good choice. 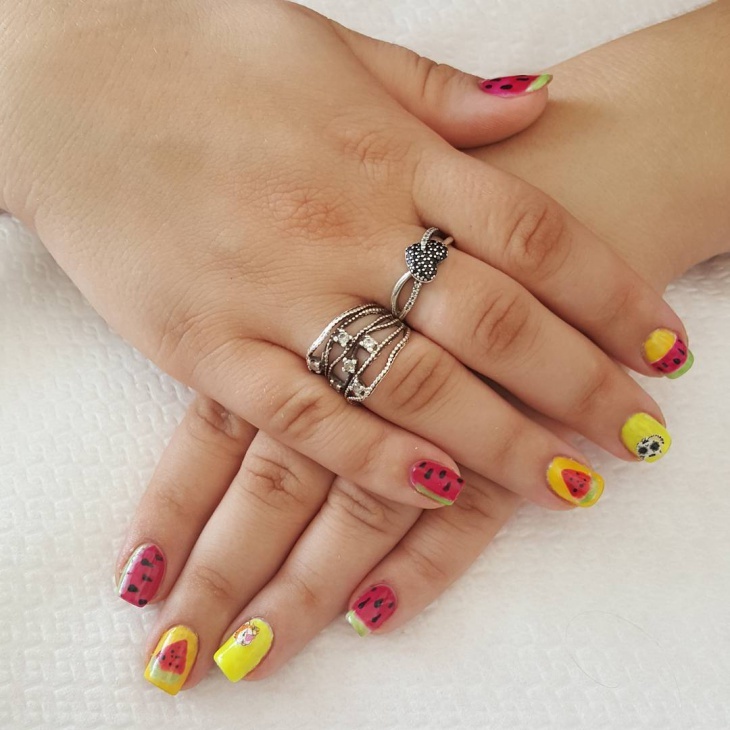 Try out varying designs verging on the same theme. Patterns and solid colours of the sun, particularly orange and red make for an intriguing clash that draws the eyes, not repels them. 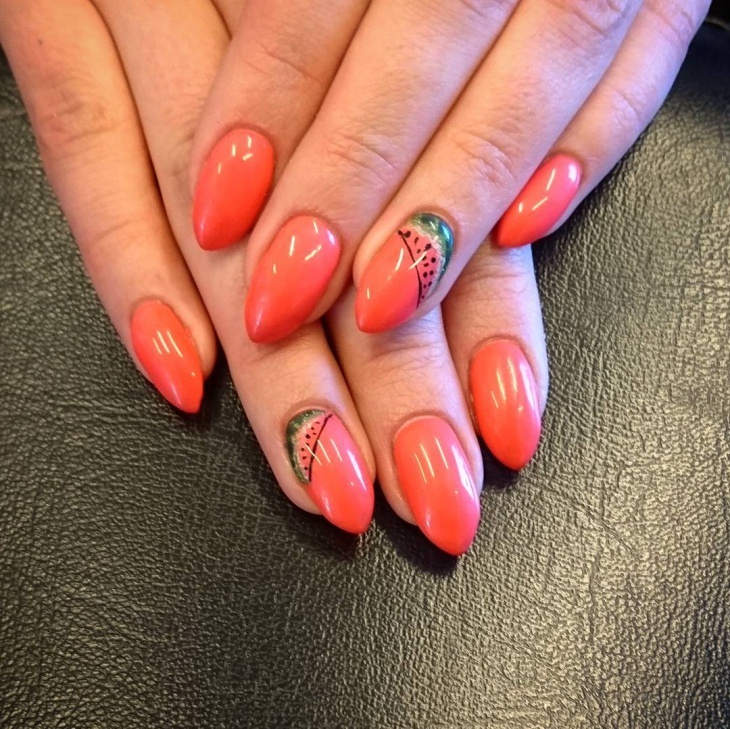 To achieve those subtle shades, let the base coat dry, before applying a clear top coat, and following that with the next shade – thinly applied, so as to show a merging, rather than two separate colours. 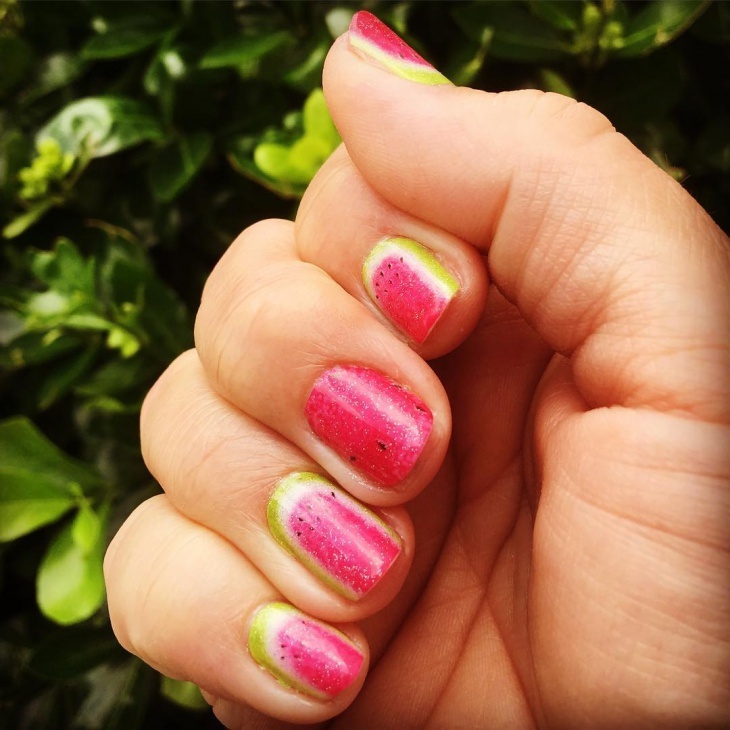 You can get that professional sheen by using a gel top coat. And finally, if you have one pattern, why not add another? 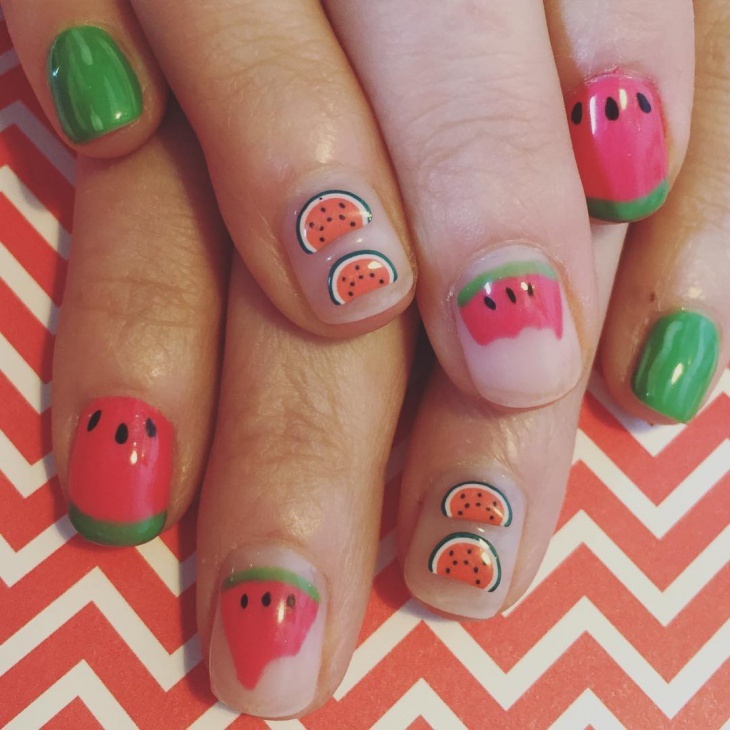 As delicious as watermelons are, a recurring design tends to be rather boring. 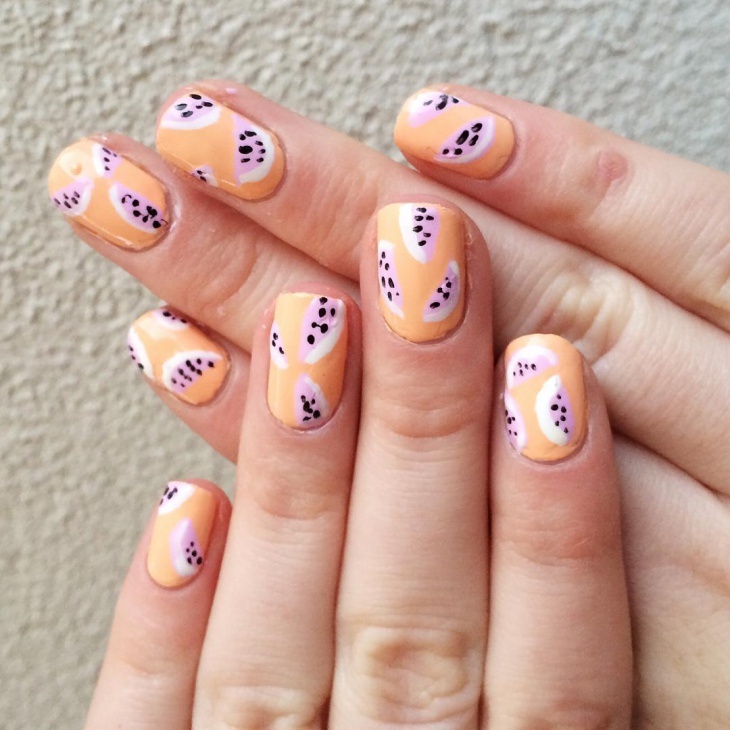 Polka dots and pastels make for a nice change though, especially ice-cream shades like this. 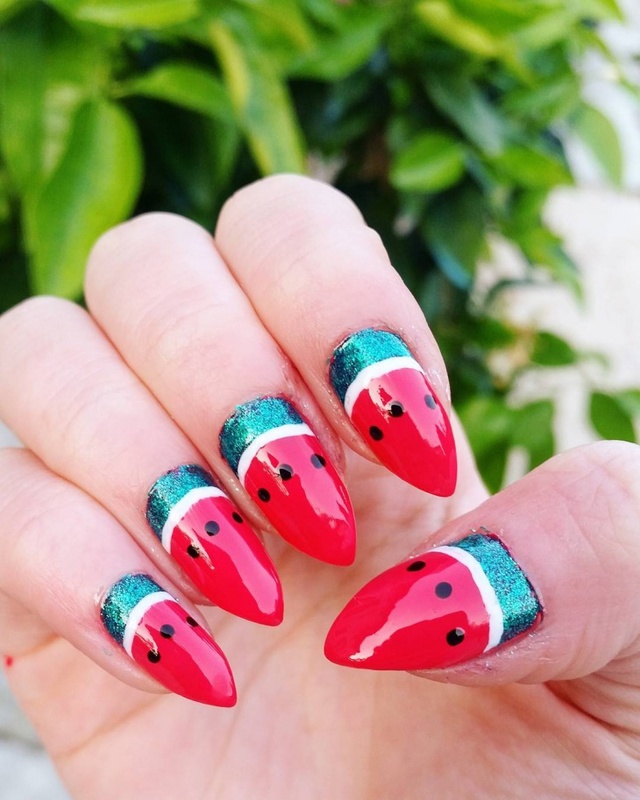 Perfect for tapping your chin thoughtfully while the lifeguard asks to bring you another smoothie! Take advantage of the summer, folks. There’s much to be enjoyed in this weather, and why not do something constructive at that? 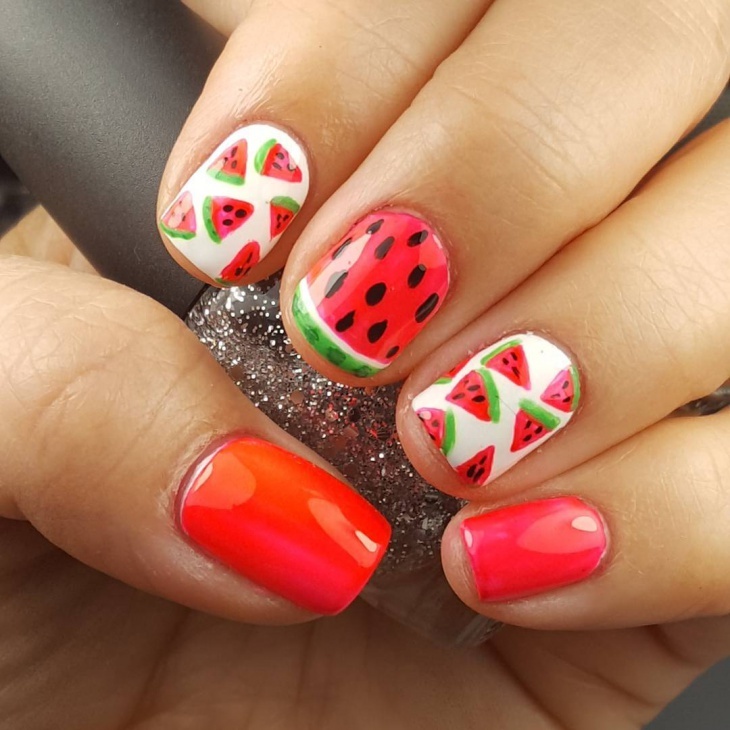 Nail art is reaching its peak now with a stunning array of designs with tutorials, particularly on sites like Pintrest. It takes a meticulous hand – but it’s definitely achievable. 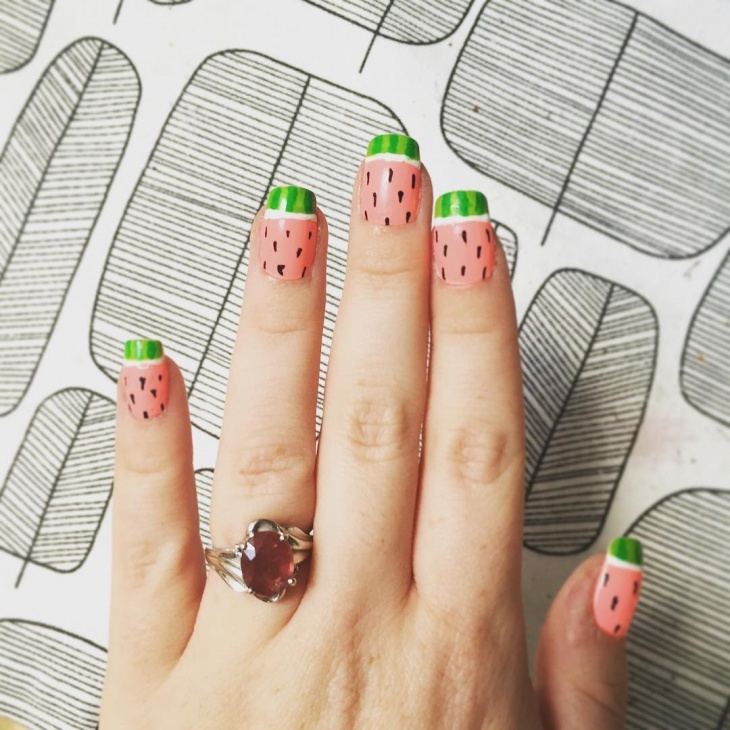 Send us pictures of how far you’ve come along with your art, and hope these tips have helped!